The Barber dime coin, issued by the U.S. Mint between the years 1882 and 1916, was designed by the U.S. Mint’s chief engraver, Charles Barber in the late 19th century. Following the production of the Barber dime, the mint changed the dime’s design twice: The Mercury design was struck from 1916 to 1945, and the Roosevelt dime was struck from 1946 to 1964. 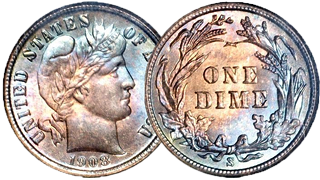 Modern dimes are minted from a copper nickel mixture. Given the wide circulation of Barber dimes, Barber dimes are still relatively common today.